75yo John presents to the hospital with a lower respiratory tract infection. His blood test show eGFR is 40 and creatinine >100. His previous blood test earlier in the year eGFR 79 and creatinine 65. You diagnose him with acute kidney injury. 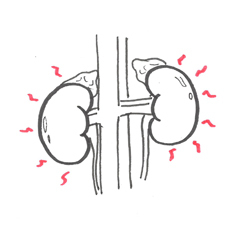 Overview Acute kidney injury (AKI) is the syndrome arising from a rapid fall in GFR (over hours to days). It is characterised by retention of both nitrogenous (including Urea and Creatinine) and non-nitrogenous waste products of metabolism, as well as disordered electrolyte, acid–base, and fluid homeostasis. Classification The aetiology of acute kidney injury can be simply divided into pre-renal, renal and post renal causes. Drawing for urine sediment examination….